The sea-swept rocks of the remote Maine coast are habitat to a panoply of colorful creatures. It's an opportunity, a little-studied maritime ecosystem. This is in part due to difficulty of access and in part due to the perils inherent in close contact with its rarest and most spectacular denizen: Oracupoda horibilis, the common surf shoggoth. This year's Hugo for best novelette went to Elizabeth Bear for her WWII-era alternate natural history tale "Shoggoths in Bloom". As the title suggests the story features shoggoths, creatures from HP Lovecraft's Cthulhu Mythos, but with a slightly different twist. 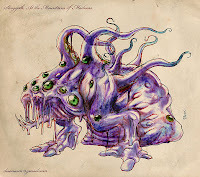 Image: Shoggoth by pahko @ wikimedia commons. Also see pahko at DeviantArt. YAAAY! Marine biology in science fiction that isn't psychic dolphins! Must find a copy of this story. Forex Megadroid: I can't see that pictures is dolphin I thing that like a monster... Incredible creatures... Where's the story?